After the launch of our SK500LC scale model at Intermat the demand for this model from fans has been fantastic. Don't take our word for it read the review from English collectors magazine PMMW, which is a English collectors magazine. We sent this model to Steven Downes editor of PMMW. The following review was in May/June 2018 issue. In 2016 at the Bauma trade show, I had a discussion with the Kobelco marketing team and told them that, while the range of Kobelco models are nice, most of them are in the wrong scale for the construction equipment collectors, and so began a project to commission 1:50th scale models for the European market. 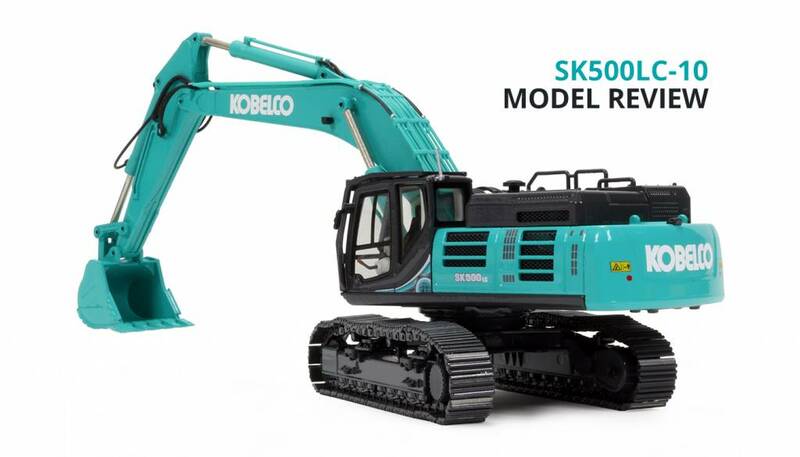 Interestingly, Japan had already started to commission 1:50th scale models around the same time with the development of the Kobelco SK210LC model which was produced by Motorart, with them following up with the SK140 (Both already reviewed in previous issues of PMMW). Two manufacturers were selected to produce new European spec models, Ros and Conrad. The Kobelco SK500LC-10 tracked excavator weighs in between 50 and 53 ton depending on the configuration with a powerful Hino P11C-VN 6-cylinder diesel engine with intercooler turbo-charger which is Stage 4 emissions compliant. The machine is available with rigid or MVLC type undercarriage and double grouser shoes are available as an option over the standard triple grousers. What is interesting about the new release from Conrad is that there are a number of engineering decisions which have not been made before, with levels of detail not usually seen on a Conrad model. For me, the most interesting aspect of the model is the detail level within the cabin, with a multi-coloured interior including the side and rear panel detailing, fully shaped joysticks and hydraulic cut-off lever which even has the end painted red. A contoured seat, foot pedals and printed glazing simulating the rubber window seals all come together to make a very realistic impression, topped with exterior cab detailing which includes metal grab rails, aerial and a protective ROPS frame with top guard which offers protection for the roof window. Printing has been used to good effect, like the tiny silver circles on the frame representing the bolt heads. Other firsts include the painting of the pistons used for the hydraulics, with each one having a blue end to match that of the original. Not only that, but for the first time, all the rivet heads have also been painted blue which was certainly a surprise for me. All the hydraulic hoses have been replicated using both hard and flexible plastic to achieve a very good effect, particularly for the lift cylinders. The undercarriage is engineered on the MVLC system, with the ability to reduce the width of the undercarriage for transport while giving a wider stance during operation and this works well on the model, with each track frame incorporating the lower roller detailing and with tensioned idler wheels to keep the metal track belt taut. The body casting includes cut-outs in the side with a perforated grill inserted within the body which really does look effective while the upper surface of the engine bay is printed with anti-slip mats. The Generation 10 graphics on the sides of the body have been fully replicated and the printing in general is excellent throughout, from the tiny warning labels to the Kobelco logos. Metal safety railings have been fitted and there are two video camera housings, one at the rear and one on the side. Three self-fit mirrors are included in the box which fit onto the railings and the grab rail fixed to the cabin frame although no instructions are included as to exactly where the mirrors should fit. In the next issue, I follow the Kobelco team as they visit the Conrad factory to produce a video of the model making process and take a look at the SK500LC-10 in the yellow colours of Kobelco America.